Angs of Maharaj found at Gurusar Jalal village in district Bathinda. According to Journalists from the village, sikh media reports and sikh journalists, The incident said to be took place 4 or 5 AM. Concerned over desecration of Sahib Sri Guru Granth Sahib Ji in Punjab, Union Home Minister Rajnath Singh yesterday spoke to Chief Minister Parkash Singh Badal and assured him “all possible help” from the centre to meet the situation that has arisen because of these incidents. “Spoke to Chief Minister Shri Prakash Singh Badal who apprised me of the prevailing situation in Punjab. Assured him of all possible help from the Centre,” Mr Singh tweeted. During the conversation, Mr Singh conveyed to Mr Badal that the central government was concerned over the situation in Punjab and asked the chief minister to take necessary steps to maintain peace in the state, sources said. He promised all help to defuse the tension prevailing in the state. With no let-up in protests over sacrilege of Dhan Dhan Sri Guru Granth Sahib ji Maharaj in Punjab, 10 companies of the Border Security Force (BSF) have been deployed in four districts of Punjab. Three companies each of the BSF have been deployed in districts of Amritsar, Ludhiana and Jalandhar, while one has been deployed in Tarn Taran. 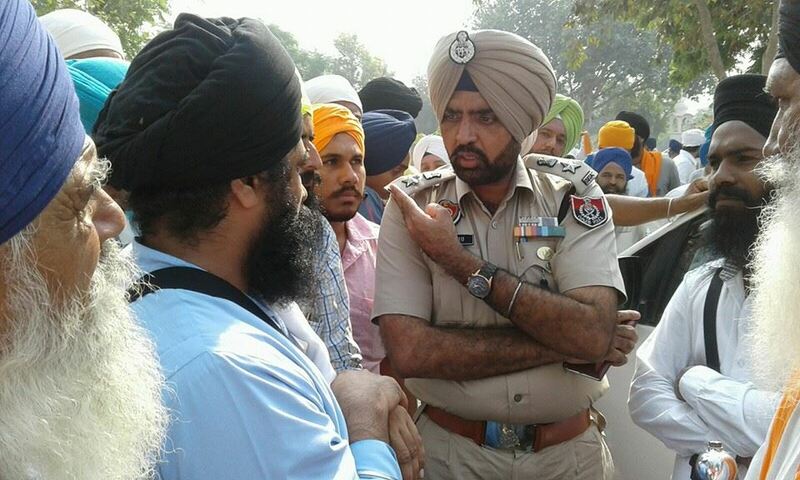 Tension has been prevailing in the state since incidents of Sri Guru Granth Sahib ji Maharaj sacrilege have come to light sparking protests across the state. Meanwhile, in a fresh incident, Angs of Sri Guru Granth Sahib ji Maharaj were found torn at Gurusar village in Bathinda district on Tuesday morning leading to tension in the area. As the incident came to light, villagers gathered to protest against the incident. Pics & Video - Antim Sanskar of Bapu Pooran Singh Nihang at Harike, district Tarn Taran.